RENTS in Brisbane are holding firm despite an oversupply of new apartments as surplus stock is slowly absorbed by rising demand, new data shows. SQM Research’s latest June update reveals rental vacancies in the Queensland capital rose slightly to 3 per cent last month, with an estimated 9886 residential rentals sitting vacant. But rents are not falling, with houses in Brisbane registering an increase in June of 0.5 per cent to $452 a week. Even unit rents rose 0.3 per cent during the month to $370 a week. The biggest shock was Sydney’s rental market, which recorded the highest vacancy rate in at least 13 years and a fall in the asking rent for a house of 0.8 per cent. SQM Research managing director Louis Christopher said he was confident the worst was over for Brisbane landlords and the city was set to benefit from Sydney’s housing downturn. “I believe Sydney will shortly record a fall in its population growth rate due to a relatively recent steep rise in interstate migration towards Queensland,” Mr Christopher said. 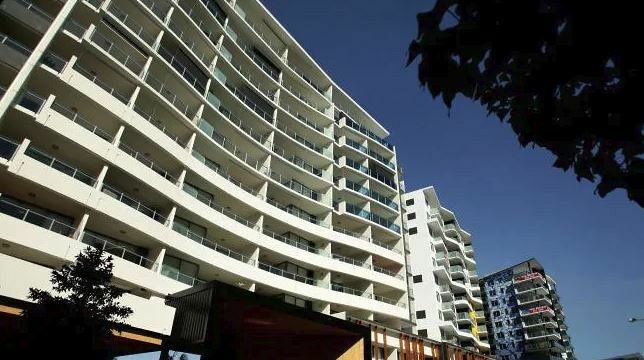 Gold Coast rental vacancies are on the rise at 2.8 per cent, but Mr Christopher said that was likely reflective of a hangover from the Commonwealth Games. SQM Research has named a two-bedroom apartment in Surfers Paradise on the Gold Coast its “distressed property of the week” because its price has been slashed from $295,000 to $275,000. The property at 1/37 Peninsular Drive in the Surfers Del Ray waterfront complex is fully furnished and within walking distance of Cavill Avenue, Surfers Paradise beach and public transport. Mr Christopher said the low price would appeal to first home buyers. “This could be a good bargain as the vendor is keen to sell,” he said. Mr Christopher said asking prices for two-bedroom units in Surfers Paradise had increased 5.6 per cent in the past quarter, while asking rents for the same product had declined 3.7 per cent in the same period.